Gringes..."Ive got to admit it's getting better..."
This past June marked the 42nd anniversary of the release of the Beatles seminal "Sgt. Pepper's Lonely Hearts Club Band," and with it, one of my favorite songs of the album, "Getting Better." Today marked my umpteenth attempt at successfully scoring poolish baguettes, and to my utter joy a success at last! So now I'm humming the tune in my head....over and over. 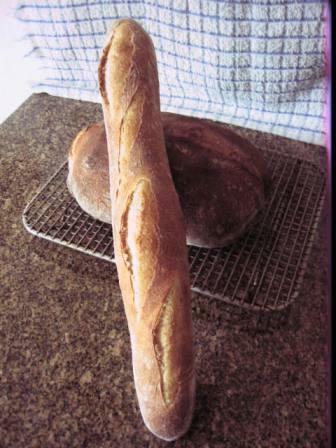 I did two bakings actually: My first mix this morning was for the baguettes with poolish, and I followed that up with another poolish-based rustic bread: Hamelman's Pain Rustique by way of James MacGuire and Raymond Calvel. I love the fact that this no-knead, no-shape bread is ready to bake in just over two hours (not counting the overnight fermentation of the poolish). 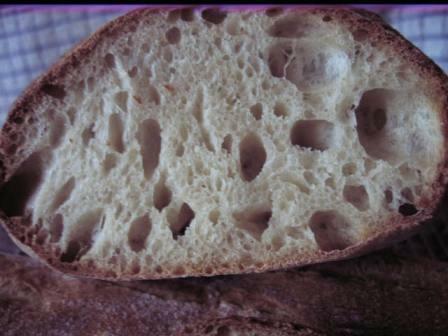 What other bread can be created in such a short time with the distinctive nuttiness of the poolish-based dough? As for the baguettes, I think I'm getting closer to the secret of getting my gringes to open consistently. The biggest factor, I believe, has been the transition to a couche for final proofing. 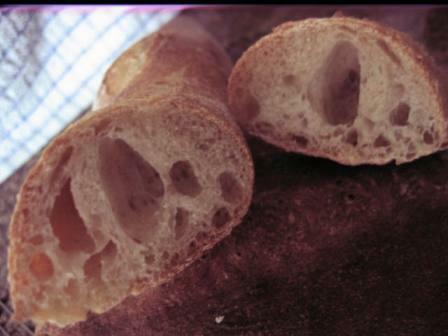 And in particular, allowing the baguettes to rise seam-side up, as we did at King Arthur Flour. Although I've repeatedly heard and read that allowing the dough to develop a "skin" will defeat successful scoring, my experience since using a couche has been that the up-side of the dough gains more surface tension, and it's been obvious to me in that my cuts are no longer dragging the dough, but (for the most part), cleanly cleaving it. The second factor, I think, is a quick misting of the loaves just after scoring and before loading. Finally, I've started consistently throwing 3-4 ice cubes into my cast iron skillet in the bottom of the stove about 1 minute before loading. That's followed by a cup of boiling water onto the skillet once the bread is just in. And then at 2 minute intervals I'm again misting the loaves very quickly - just twice. So when I set the timer for 24 minutes, which with my gas stove is a full bake at about 460°, I'll mist at 22 minutes and then at 20. After that I leave well enough alone. Tomorrow I'm off to pick up a bag of lava rocks at David Synder's suggestion to see if I can successfully generate steam that lasts longer - as opposed to one scorching burst. Anyhow, as the Beatles put it so well those many years ago: "Getting so much better all the time." 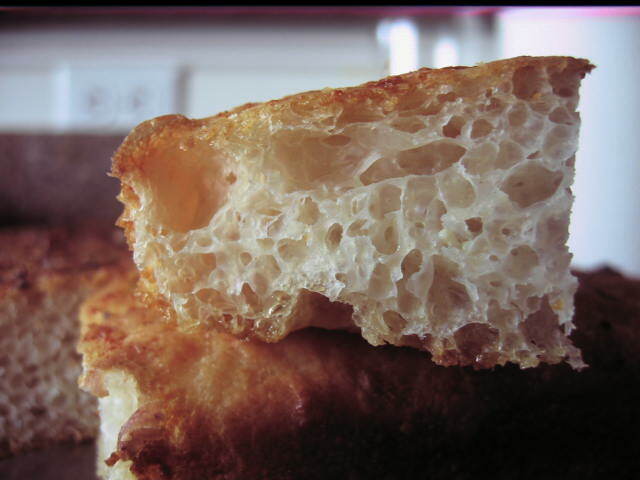 Read more about Gringes..."Ive got to admit it's getting better..."
It's occured to me more than once that in the competition between pizza dough and sauce, I've always favored (or at least rooted for) a decent dough. I figured that if you got the dough right, it was easy enough to flavor it subtly to make a good thing great. I'm frankly tired of the indignations national pizza chains visit on their doughs (like, let's bake a bunch of cheese into the dough to add to the overabundance of cheese we've already put on top of the dough). Enough already! 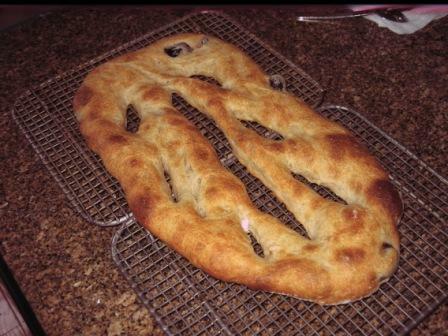 So, when stumbling upon Jeffrey Hamelman's recipe for fougasse in his Bread, I was hooked by the challenge to make a flavored dough that still stood up on its own. Recently, however, I decided to move to something that offered both more crumb and crust - and that meant focaccia. I've had great results in my bakings to date. This is a product that can be varied at will in terms of toppings - from a pizza-like bread to one that accentuates only a few flavors. Whatever your choice, it will not disappoint! 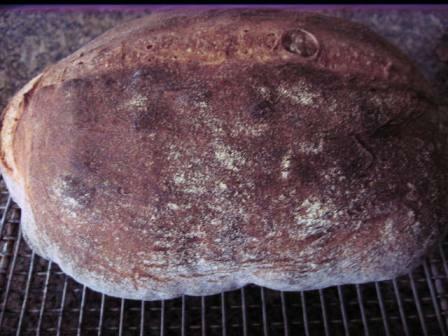 The following recipe is a composite of Hamelman's recipe in "Bread" (which uses ciabatta dough made with biga), Reinhart's recipe in "BBA" (using his herb-infused olive oil) and my own additions - primarily the addition of roasted garlic to the dough). Grated Pecorino Romano (or Parmesian) cheese = 2 tbls. The biga should ferment at about 70° for between 12 -16 hrs until domed with a slight recess in the center. I've used 25g of my firm starter (approximately 18% of the biga); if using instant dry yeast, you want to add just specks of yeast. Approximately 3.5 hours before the bake mix final dough on speed #1 for 3 - 4 minutes. As it comes together, cut biga into it. Mix another 3 - 4 minutes on speed #2 and add in 1 tsp of mashed, roasted garlic in increments. Dough will be slack, but should exhibit extensibility - you should be able to grab and stretch it without it tearing easily. Allow a bulk fermentation of 2 hours, with folds at 45 minutes and 90 minutes. Put 2 tbls olive oil into 9" x 13" x 2" baking pan and coat thoroughly. Scrape dough onto heavily floured work surface and stretch. If necessary, allow bench rest to get necessary extensibilty. Place in pan, sprinkle with grated cheese, cover with plastic wrap and bench rest for 30 minutes. After 30 minutes, pour 1/4 c. of herb-infused olive oil onto dough, and incorporate by dimpling dough with your fingertips (at this point you do not want to degas the dough, so only use fingertips!). Allow to rise for about another hour, until nearly doubled in size. Place into pre-heated oven at 450° and bake for about 20 minutes. 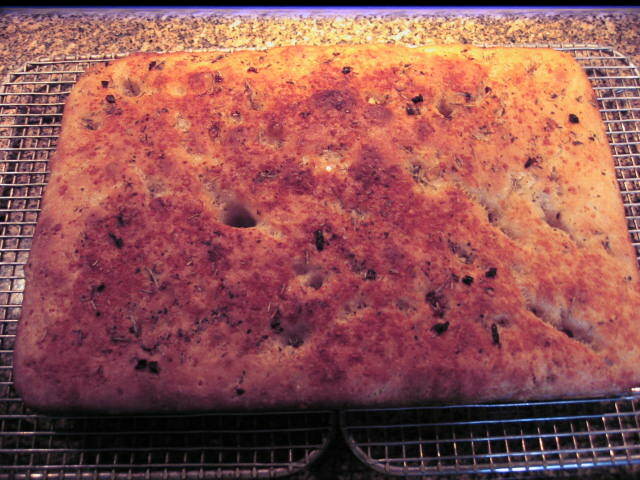 The sides as well as bottom of the focaccia should be browned, and the top should be nicely browned witht a crust that still yields when pressed. Cool 30 minutes and enjoy! I think a marinara sauce would be a good accompanyment, but so far haven't been able to keep the final product around people long enough to test. I think the secret to this is Hamelman's advice to not go wild with toppings. Too much will not only inhibit the ability of the dough's final fermentation, but inevitably is going to overwhelm the flavors in the dough itself. A great treat, and a nice vacation from pizza! 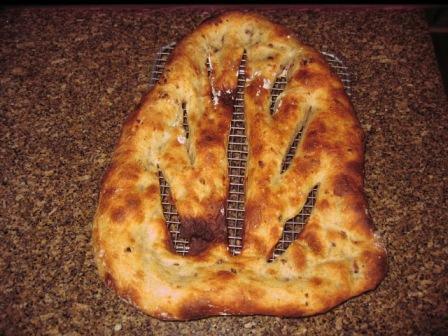 Last week I tried Hamelman's fougasse with olives recipe for the first time and had a very happy outcome. However, in attempting to move the bread onto parchment after scoring it, I nearly had disasterous results, since the scoring leaves it without any 'backbone.' So I resolved to do a bake today avoiding last week's hassles by allowing the fougasse to rise on parchment paper. 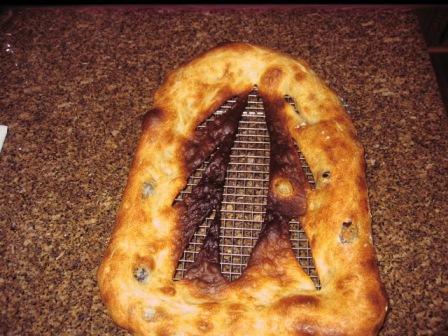 Trouble is, I was too clever by half in my approach (as the results of my niçoise olive fougasse below attest). Here's what happened, and, in retrospect, how to avoid my mistake. 1- it's lightly shaped into a ball and allowed to bench rest for about 20 min. 3- picking up the dough, you then stretch it out to about 1 1/2 times its orginal length, and then fashion it into a triangle whose base is about 1/2 of its length. After that, it's scored and loaded for the bake. My misstep occured in step #2. I lightly floured parchment paper, and then rolled the boule into an oval and allowed it to rise for an hour. Unfortunately, after an hour resting on the parchment, it effectively glued itself to the paper, which made step #3 impossible. In attempting to scrape it off onto a floured countertop, I severely degassed the dough. Ergo the very, very overbaked (shall we just say burnt) middle of the loaf. With my second bake - a roasted garlic and anchovy loaf - I smartened up and in step #2, I rolled out the dough into an oval on a well-floured surface - not parchment paper. After the hour's rise, I was able to lift if off the countertop without degassing it, and then transferred it to the parchment paper, where I did the final shaping (#3). You can see the quite different result below. I get raves about the bread - it's a bit like pizza without the sauce. In fact, someone suggested that a marinara dipping sauce would be a good accompaniment. I'm surely going to continue baking this. Hopefully, the lessons learned in this round will lead to trouble-free shaping next time!